Fumigation and fogging are very important processes in cleanroom area to minimize and control the microbial load. To keep the controlled area from being contaminated in pharmaceuticals, two processes namely fumigation and fogging are used. Both the processes are used for the same purpose, but the difference between fumigation and fogging in pharmaceuticals is great. Moreover, fumigation is banned in few pharmaceuticals because of its negative effects while fogging is a safer option than the former. It is very important to know both the processes to thoroughly understand the differences. In fumigation, formaldehyde solution is mixed with the potassium permanganate in a fixed proportion. This mixing of formaldehyde with potassium permanganate gives rise to fumes, which are very effective in killing bacteria, fungus, and their spores. This is one of the most preferred ways of controlling the contamination. While fumigation involves spraying formaldehyde and potassium permanganate in liquid form, fogging uses the mixture of hydrogen peroxide and silver ion solution to control the contamination. Fogging also requires a fogger machine, which effectively fills the space with the fogging solution. There are many different disinfectants used as the fogging solution but the above mentioned are most commonly preferred. Nowadays, fogging is used more than fumigation. As mentioned earlier, this is due to the negative side effects of fumigation. Fumigation involves formaldehyde solution, which is carcinogenic or simply known as cancer causing solution. The user has the risk of getting infected with cancer and that is one of the main reasons as to why fumigation is banned. Apart from causing cancer, the formaldehyde solution also causes the user irritation in the eyes and nose, dizzy head, and nausea. Other than the negative side effects, fumigation also requires a lot of cleaning up after the process is implemented. After the process of fumigation in the controlled area, there is a requirement of de-fumigation in that area too. This generally requires air handling unit, also known as AHU, which has to be continuously run for a few hours in order to remove the residues from the air. Also, mopping and cleaning of the equipment and the area are also needed after fumigation. While fumigation has so many drawbacks, fogging is completely safe. 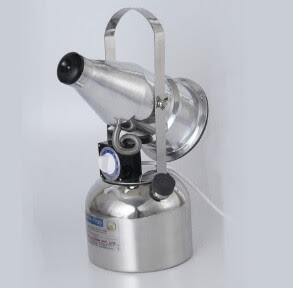 The fogger machine simply sprays the hydrogen peroxide and silver ion solution in the form of the aerosol in the controlled area. Also, there is no risk to the personnel handling the equipment and there is no need for cleaning and moping or any other activity like de-fogging after the process. It is completely safe and the residues in the air decompose with water and nascent oxygen. To conclude, obviously fogging is a better and safe method to control the contamination in pharmaceuticals. With the grave difference between them, fogging is the one which is more preferred in the two as it is safe for the personnel and no extra work is required. The hydrogen peroxide and silver ion solution kills bacteria and fungus without any difficulty and there is no need of taking care of the residues, unlike in the process of fumigation, where regular care is required to keep the area as well as the personnel handling equipment safe. Therefore, fogging is preferred between the two. Hii sir, i'm working in Pharma industry, and new to this site, thanks for the knowledge repository.